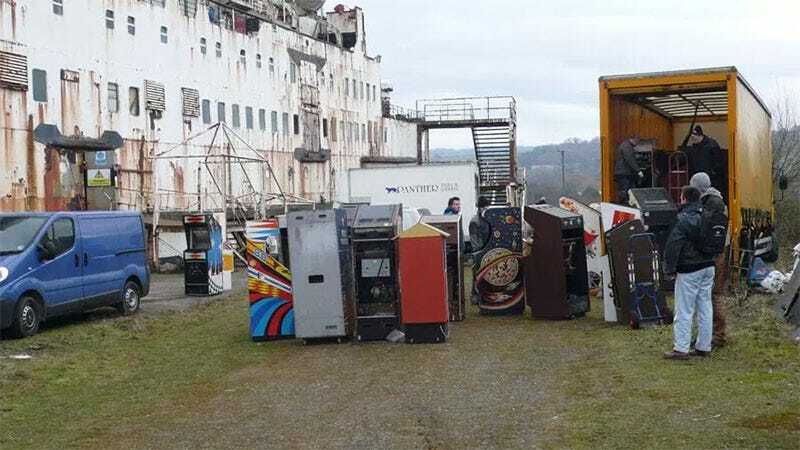 Tony Temple has written one hell of a story about a “raid” on the The Duke of Lancaster, a beached and rotting former luxury liner in Wales that for over 30 years had hidden a treasure trove of classic arcade games inside its hold. The ship, built in 1956 to move passengers around in style, was in 1970 converted to a car ferry, and her last commercial voyage was in 1978. In 1979 it was sold to an investor who wanted to turn it into “The Fun Ship”, and it was brought off the coast of Llanerch-y-Mor, North Wales to be converted into a giant floating hotel/bar/arcade/aquarium/fishing spot. These ambitious plans never came to fruition, and the ship just sat there, slowly rusting in the elements for decades until in 2009 some urban explorers got in and took some photos that got the attention of the British arcade collectors scene. After a lot of wrangling, some confusion over lost phone numbers and then a mad scramble for a crane—all while a very recent leak was threatening to damage the cabinets—the machines were saved. So the net result was that one by one, over 50 classic arcade machines were saved, and the team pulled off what is considered the most audacious arcade raid ever carried out here in the UK. These cabs are now in the safe hands of collectors across Europe and are in the process of being repaired and restored. And this is the essence of the hobby – finding, rescuing and restoring these early games. This was truly a time capsule. Every game that came out of the hull of the ship was from around 1980/81 and no later. It was quite a find to say the least. Read the full account here, it’s such a cool story.